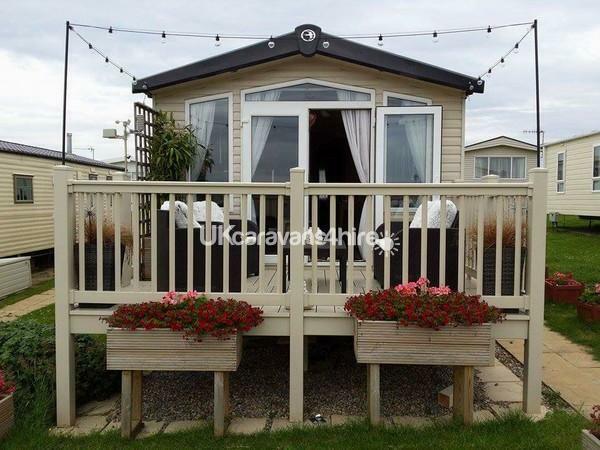 To book our beautiful caravan you will need to pay a £50.00 non refundable deposit. Full payment will then be required 6 weeks before your arrival. 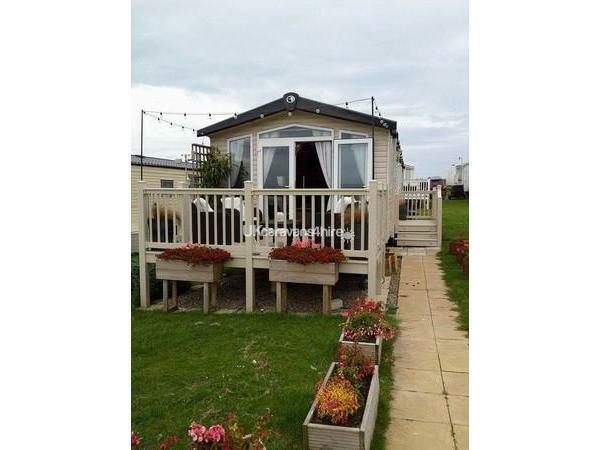 A £50.00 refundable bond is also required, this will be refunded once the caravan has been inspected after you have finished your holiday. The caravan is located on Maple Rise. it is a 2013 Swift Bordeaux exclusive. Benefiting from its own car park space and having veranda's to both the front and side. 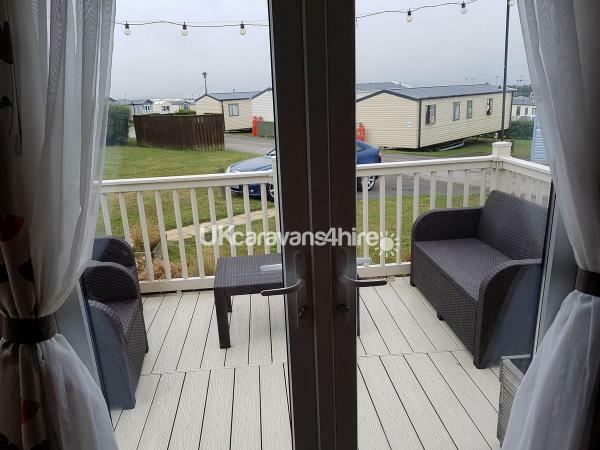 Patio doors lead out on the main front decking which has rattan seating and a table which is ideal for taking in the views and relaxing on a night, both decking areas are illuminated and these are on an automatic timer. All rooms have central heating which are controlled by thermostatic valves, there is also a gas fire to the lounge area. 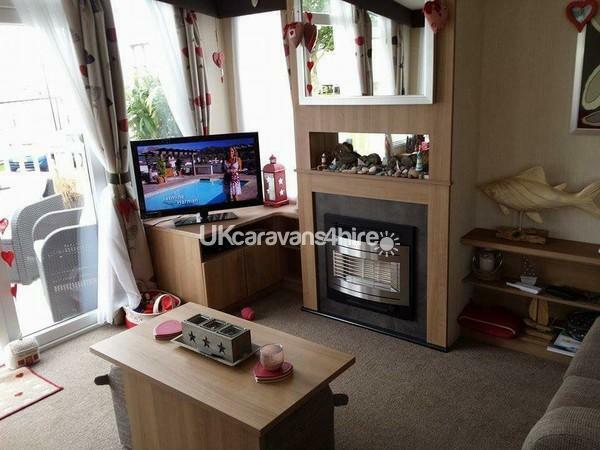 Inside the van you will find comfy leather 2 and 3 seater reclining sofas, A 40 inch TV is located in the corner of the lounge which also has a DVD player attached, there are a number of dvds in the cabinet below for your enjoyment. 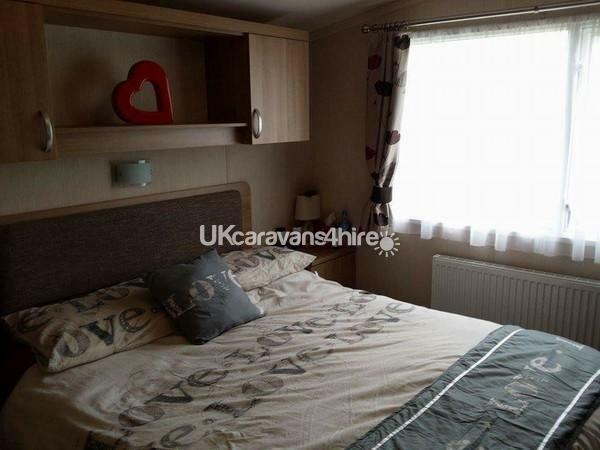 The caravan also benefits from a built in radio and iPod docking station, you will also find a number is plugs with charging points for your tech. 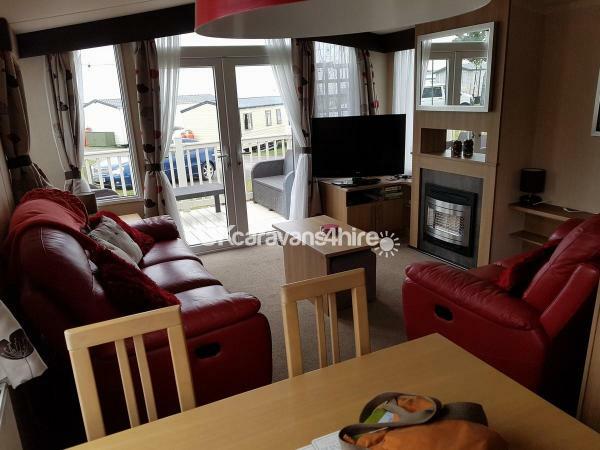 The lounge leads into the well equipped kitchen with full size 4 burner oven and hob with extractor fan, there is also a modern microwave oven, all crockery, pots and pans and a selection of knifes for preparing food. There is a full size built in fridge and separate freezer within the kitchen area. 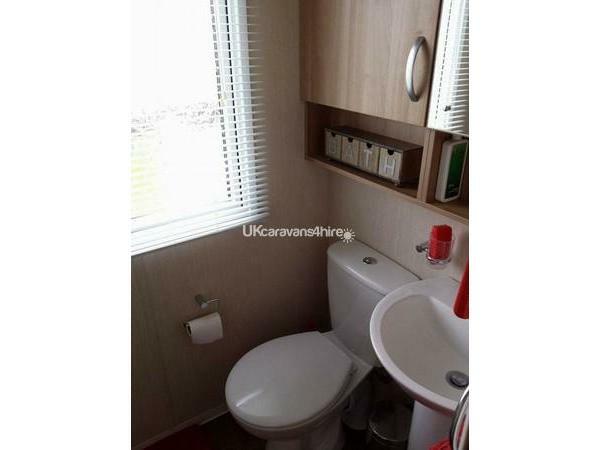 The main bathroom consists of toilet, shower and wash basin with lots of storage for bits and pieces. The corridor leads to the second bedroom which has twin single beds, overhead storage and a wardrobe. there is also a mirror on the wall. The main bedroom which is en-suite is spacious having plenty of room to walk around the king size bed, lots of storage including drawers, a wardrobe as well as a lit dressing table area including a stool. You will also find a digital TV and DVD player in the master bedroom. A fire extinguisher, smoke alarms and carbon monoxide detectors are located in the caravan for your safety. Entertainment passes are not included in the price of your holiday, however can be purchased from the Blue Dolphin reception centre for a small additional cost. Quilts and pillows are included, so you only need bring your sheets, pillow cases and towels. Please note the master bedroom bed is king size. 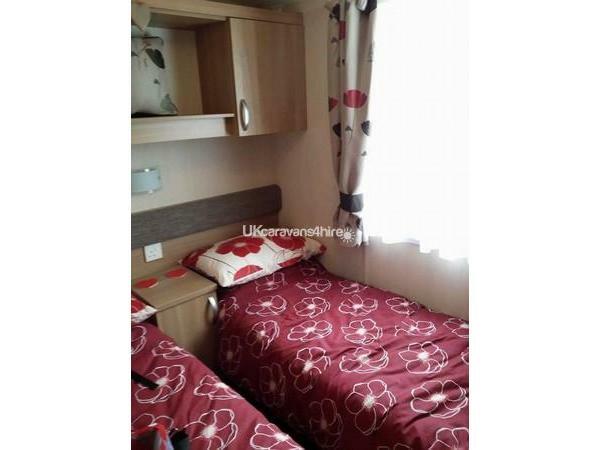 The second bedroom are standard single bed size. A £50.00 bond is required at the time of booking, this will be refunded 14 days after you have departed and the caravan is left in a satisfactory condition. PLEASE NOTE SMOKING IS NOT PERMITTED IN THE CARAVAN. A non refundable deposit of £50.00 is required to reserve your required dates. There is lots to do on site including a kids play area, both inside and outside, a swimming pool, bar and restaurant facilities as well as 2 entertainment rooms and an amusement area. There are go karts and a small fishing lake on site too. The site is located between Scarborough and Filey, these being approx. 8 minutes and 15 minutes away. both have blue flag beaches and are safe for kids and adults to paddle or swim. Scarborough boasts some fantastic restaurants and you will find details of these on the welcome pack in our caravan. You will also find some fresh milk, tea and coffee in the van when you arrive as well as some biscuits to help you relax from your journey. There is dog walking areas on all beaches, however Cayton bay beach welcomes dogs all year. you will find details of how to access this beach in our welcome pack. Cot and high chair hire can be arranged for you at a small additional cost of £10.00 per week per item, there is a £10.00 bond also payable. please identify these items on the booking form. We also have a Web site which provides more detail of our van, the facilities and the surrounding area. 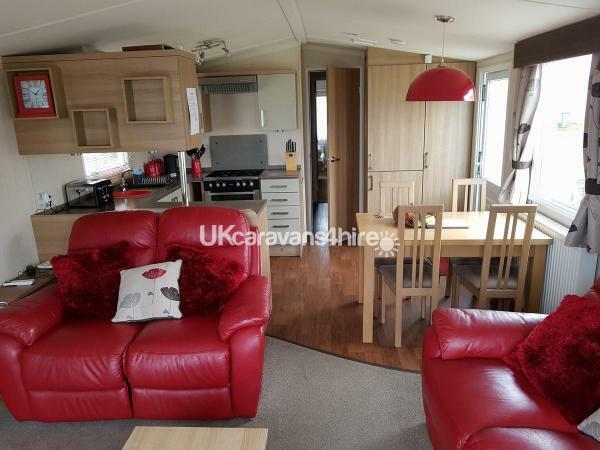 Best caravan we have stayed in and in a good spot on the site with own car space . Lovely comfy reclining sofas and king sized bed in large bedroom, not cramped at all. Loads of room for clothing, and storage. Proper table and chairs was one of the reasons for booking this one, plus the bed, patio doors and decking was great to sit out and relax. Looking forward to the next holiday in this caravan. Owner is lovely and great communication with her. 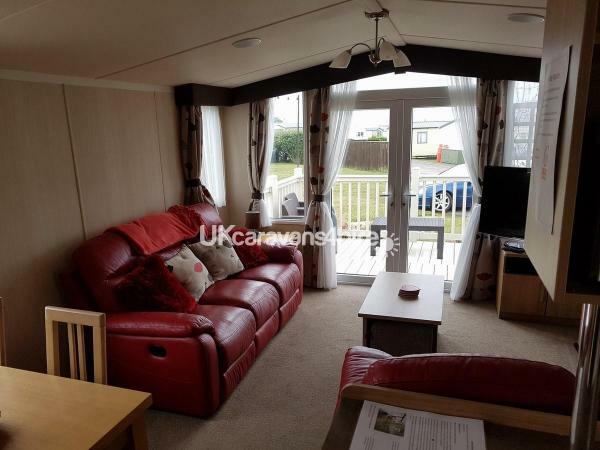 Would give this caravan more than a 10 rating if we could.was a lovely caravan in a perfect spot on the park,nice and quiet but within easy walking distance to the club and arcades.lots of lovely walks for our dog as well and an added bonus of taking your dog into the outside bar area too. .the caravan itself was immaculate and a real home from home, had a great reclining sofa and a large tv,perfect for us at night when relaxing after a busy day.has a king size bed and lovely dressing table and ensuite bedroom with loads of storage and space.the outside veranda was great and a real sun trap ..the owners communication is fab.always quick to reply.would highly recommend this caravan for a holiday and would not hesitate to book again..
Great location in quiet part of the park with its own parking space. 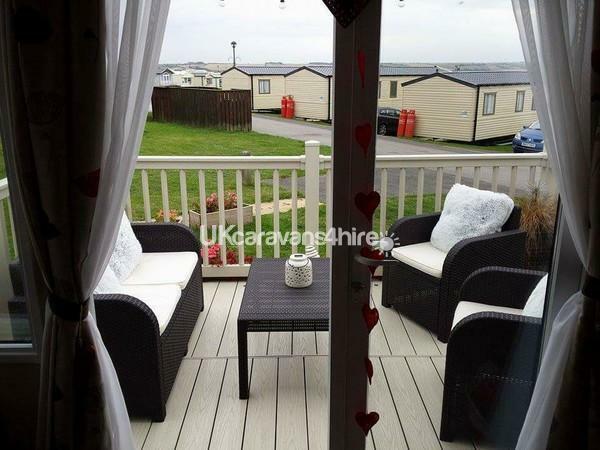 The caravan is well set out with comfortable reclining settee and large ensuite master bedroom. We were unable to sample the decking area but this this would be great when the weather improves. The communication with the owner was good and we even got early access to the caravan. I would definitely recommend this caravan. 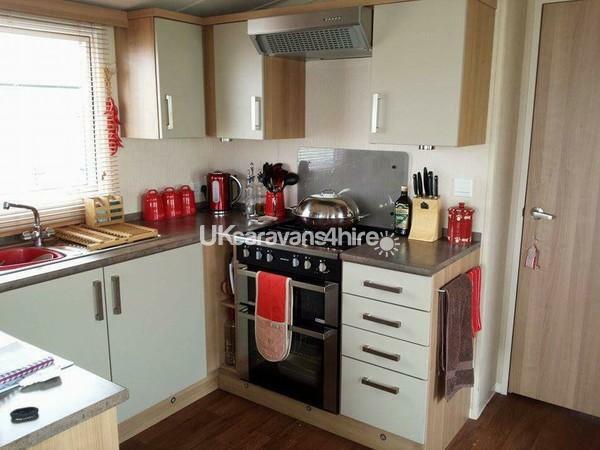 Caravan was very spacious and in immaculate condition. Owners, who were very friendly and welcoming, were there to meet us on arrival, and was very informative. The van is situated in a quiet area of the site which made our stay even more relaxing.